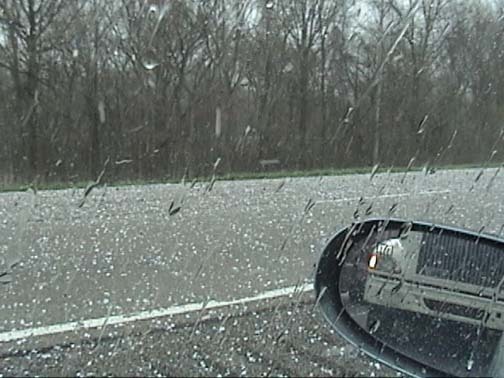 I chased in southern Illinois today - a hail chase, as it turns out. The chase began on a sombering note - during the noon hour, I attended the visitation for the husband of a former colleague. He was the one individual who was killed in the Fairview Heights tornado on April 2. This was a terrible reminder of the fact that the storms which so fascinate us also cause terrible loss of life and misery to the loved ones left behind. After the visitation, I made a quick stop to fill my nearly empty gas tank, and was under way heading southeast on I-64 by around 1:20, toward my target in southern Illinois. By this time, SVR warnings had already been issued for Randolph Co., IL, and several points to the southeast of there. I could see the rather sheared-over tower of the Randolph Co. storm to the southeast, and knew it would be a race to beat it to where it would cross I-64. By the time I was in the eastern part of St. Clair Co., I could see that I was not going to beat the storm. It looked like it might have some hail in it, but had very little lightning, was quite small, and appeared rather high-based. Since the better storms appeared to be farther southeast, I decided to punch through, expecting perhaps a little small hail but little more, going from the appearance of the storm. Hence, it was a bit of a surprise when I promptly got caught in 1.25 inch hail at 1:40 p.m. where I-64 crosses the Kaskaskia River. 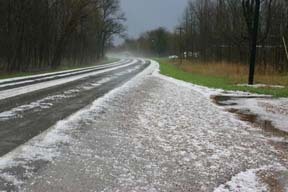 I knew something was up when all the cars ahead of me hit the brakes as they entered the precip, so I slowed down quickly but soon was in the hail. Most of it was anywhere from dime to quarter size, but one stone that landed next to my car was at least 1.25" in diameter. Though I did not intend to get into this hail, it did result in my getting the best hail video I have ever gotten. 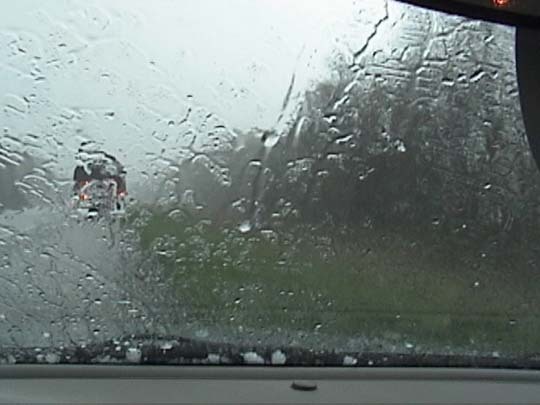 Here is a video capture from the time when the largest hail was falling; this video capture gives a sense of the typical size of the hail; the small knob on my dashboard is about the size of a quarter, for size comparison. 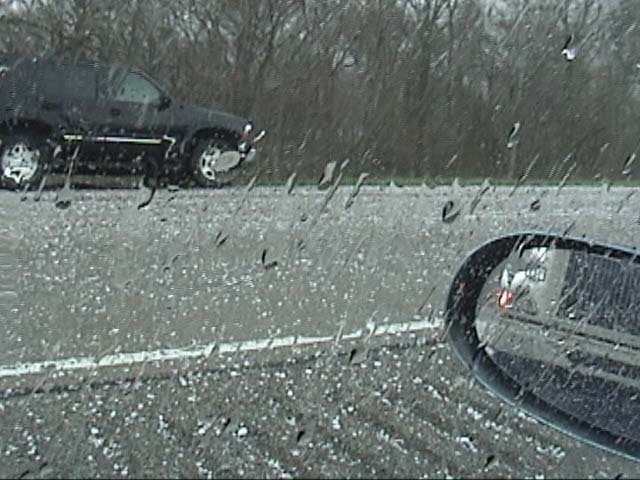 The hail lasted about 5 minutes and brought the traffic on I-64 to a halt. Most of the vehicles pulled safely off the road, but for a time traffic was briefly stopped due to people stopped on the actual highway. I was concerned about what the hail might be doing to my car, but fortunately got only a couple minor dings - basically it held up well. About 3 minutes after I first encountered the hail, a new SVR warning was issued for Clinton Co., with the radar indicating the storm just a couple miles northeast of my location. Once I was back under way, I could see that the next storm to the southeast, also severe-warned, was quite a bit more impressive looking. Since I was again to the northwest of the storm and it, like the earlier one, was hauling northeast around 50 mph, I was still playing catch-up. Accordingly, I did not get the best view of the next storm but did catch a brief wall cloud looking southeast as I drove east on route 15 toward Mt. Vernon after exiting I-64 at Nashville. I was not about to get caught on the freeway in the hail twice! The wall cloud formed on the storm as it seemed to peak in intensity to the southwest of Mt. Vernon. It even looked for a moment like it was trying to form a funnel cloud, but that did not last long at all, as the wall cloud quickly shrank, then disappeared in the rain and hail. This storm was a VERY prolific hailer; for the last 10 miles into Mt. Vernon there was hail left on the ground - a lot in some places. Here is a photo of the accuulated hail just west of Mt. Vernon. I stopped at a couple spots to view and photograph the accumulated hail, reaching Mt. Vernon perhaps 5-10 minutes after the storm went through there around 2:55. I then decided to head south on I-57 from Mt. Vernon to poke through a break in the line of storms to try to get position on the next (and, at that time, last, storm in the line.) About 20 minutes later, I photographed a decent storm, the last in the line, looking across Rend Lake from the rest stop north of Benton. 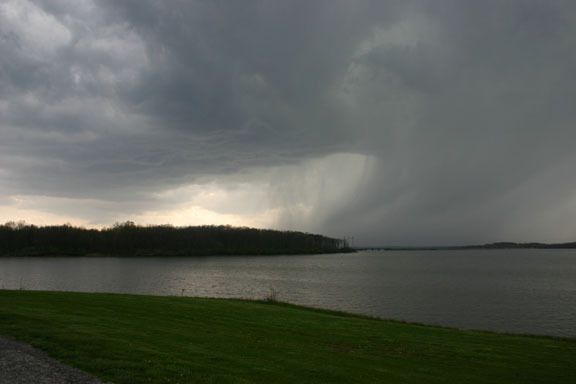 This storm, too, was severe-warned and produced hail west and north of Rend lake. It appeared quite high-based, but was rather photogenic looking across the lake, as can be seen in this photo. It was moving in a more easterly direction than the early storms, and also very fast, making it necessary for me to get out of the way quickly after taking the picture across the lake. At this point, the chase was pretty much over. I turned around at West Frankfort and headed back north on I-57, continuing north to Salem to check out a small storm that was passing north of there - but as it had no interesting features, I headed west on U.S. 50 through Carlyle (after a brief detour around an overturned semi; don't know whether or not that was weather-related), reaching home by around 6 p.m. Although they were prolific hailers, the storms today seemed rather high-based, almost elevated, so nothing came close to producing any tornadoes in the area where I chased. The Mt. Vernon storm was a little less high-based than the others, and certainly was supercellular, as were some of the others. But despite the fact that some of the storms were supercells, PAH issued not one TOR warning in IL, and none of the storms came close to producing a tornado. They certainly did produce a lot of hail, and in the case of the Mt. Vernon storm, did so over an unusually wide area. The largest hail reports in southern IL were golfball. Here are the local storm reports from the St. Louis NWS office, and here are the reports from the Paducah office.